For those needing overnight accommodations, a special rate has been arranged with Santa’s Lodge. A special rate for Lake Rudolph will be announced soon. Santa's Lodge-Decorated for Christmas 365 days a year, everyday is a Holiday when you stay at Santa’s Lodge. You’ll be welcomed at Santa’s Lodge with a vaulted lobby soaring 37 feet into the Southern Indiana skyline. The hand-hewn timbers are actually from the barn that stood on this same site in 1883. The beautiful cedar and oak wood creates a natural setting for our antique Christmas decorations including our Canadian horse-drawn sleigh! 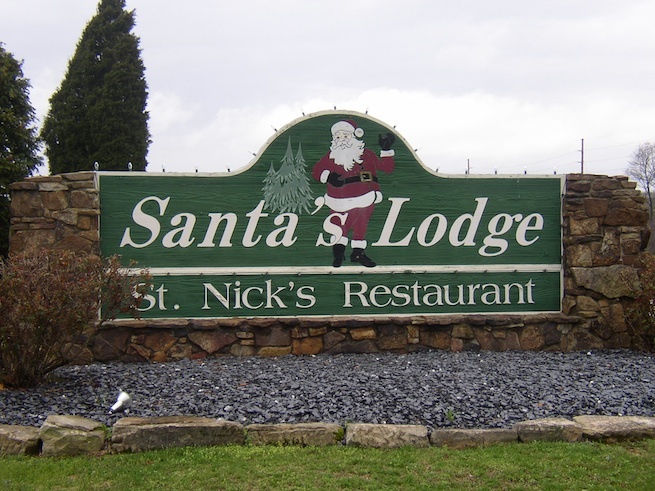 Santa’s Lodge offers indoor and outdoor pools, meeting and banquet rooms, and has St. Nick's Restaurant located on site. Phone (812) 937-1902 or the Santa's Lodge website. Lake Rudolph-Lake Rudolph Campground and RV Resort features over 240 family rental RVs and Cabins, over 230 RV and tent sites, giant outdoor pool, and free Wi-Fi. Enjoy the RV experience without owning your own RV! Phone (812) 937-4458 or visit the Lake Rudolph website. The Santa Claus Workshop is open to all who wish to participate no matter what your association is with any Santa group or organization. Presented as an interactive forum instead of a school, the Santa Claus Workshop is designed to complement other existing Santa seminars, schools, and gatherings. The Santa Claus Workshop is presented by the Hoosier Santa and is produced for the Santa Claus Community by the Santa Claus Oath Foundation. A $50.00 donation fee to the Santa Claus, Indiana Historical Society, that is tax deductible, is the only fee. Then Just pay for your personal lodging...if needed, your food, and your travel expenses.